The S4 is smaller and simpler to use than most long zoom cameras, but it doesn't offer the image quality or, ironically, the flexibility to tempt people away from more conventional designs. Like a bird migrating to the same nest year after year, Nikon has an on-going fascination with twistable cameras. 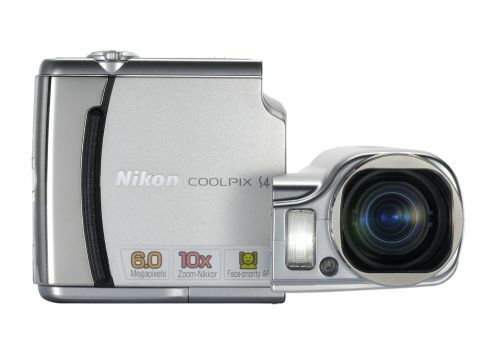 The latest model to get it in a flap is the Coolpix S4, with its 6Mp sensor and hefty 10x zoom lens squeezed into a flat-ish design that can only be described as 'camcorder fallen over'. Previous twisters from Nikon have been gawky and awkward, but the S4 feels more comfortable, even natural, to hold. The twopart design still takes a little getting used to, at least until you realise that holding the screen steady and moving the lens assembly gives the most workable configuration. Don't be fooled by the shiny metal front detailing either, as this is largely a plastic camera. A twisting camera has some real advantages. You can hold it right down to the ground or over your head and still frame images. Or at least you would be able to if the screen was up to the job. The S4's 2.5-inch LCD is sharp, responsive and works hard in dim conditions, but just can't hack it in strong sunlight. Strangely for a rotating camera, its viewing angle is also quite restricted. More annoying still is the location of the Menu button and joystick which run across the top of the screen. In use, your thumb obscures a third of the screen - this is even more of a problem when using the Delete key and (largely redundant) Display toggle. Jumping across to the other half of the camera is more reassuring. Nikon knows how to put a lens together and the 38-380mm equivalent glassware is impressive. Zooming is camcorder style - internal, silent and fast (about 2.5 seconds from wide angle to telephoto). Purple fringing occasionally pops up, although never enough to ruin an image, and there's very little sign of any serious distortion at the extremes. Autofocus isn't fast, but it gets there in the end. However, one feature is conspicuous by its absence: image stabilisation. When you're dealing with a 10x lens and sensitivity that maxes out at ISO400, you really need help keeping the camera steady, even in daylight. Sure, the S4 flashes up a little camera shake symbol when things get wobbly, and the ability to preserve a maximum aperture of f/3.5 right to telephoto is welcome, but when rival cameras from Panasonic, Canon and even Kodak sport effective optical stabilisation, the S4's warning message that your captured images are blurred simply isn't good enough. Still, at least it has a tripod socket on the base. The side-mounted flash can cast peculiar shadows, although you're unlikely to notice them unless you're right up close to your subject. Flash images are generally acceptable, but the small built-in unit does lack reach beyond a couple of metres. In red-eye reduction mode, the S4 automatically applies corrective processing as well as pre-flashes, which slows down night portraits. On the features front, the S4 is also a bit lacking. A macro mode enables close-ups, and there's a self-timer and dozens of specialised scene modes to get lost in, including a few handy ones. Face Priority AF does actually home in on faces in portraits, and some of the landscape modes do useful things like fix focus at infinity or activate noise reduction. But none of this is really groundbreaking. In the main menu, Best Shot Selector chooses the sharpest or most evenly exposed image from a series, and you can choose from a couple of continuous modes (2fps burst, multi-short or interval shooting). Movie clips are full-sized (640x480-pixels) but grainy and jerky, at 15fps. The S4 is slow in processing and saving its images, and when you see the results you wonder what the delay was for. Even at ISO50, images can have an unclear and slightly granular appearance. It's not noise as such (which isn't too bad, all the way up to ISO400) but an erosion of detail that leaves images looking flat and lifeless. Restrained colour reproduction doesn't help matters.